In practice, furigoma is tossed. One of the players takes 5 pawns, shakes and tosses them on the board as dice. If the number of promoted pawns facing up is higher than unpromoted pawns, the other player opens the game. 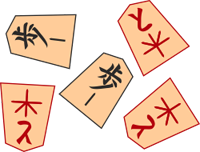 If players are equally strong, then players decide who throws furigoma. Then, both players alternately make a move during each turn. 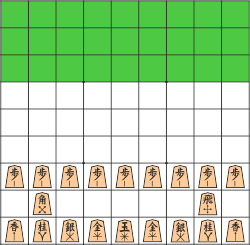 For each turn, a player may either move or drop just one piece. A player may not give up his turn, also known as passing. Players are not obligated to move a piece already touched. One may even pick up a piece from the game board and see what is on the other side of the piece. However, when the move is completed and a hand leaves the piece, the move can no longer be retracted. The object of the game is to checkmate to your opponent = attacking the opposing king which cannot be adequately parried or defended or which results in removing the opposing king from the game board. Or one of the players resigns, or the opponents agree on a stalemate (draw). 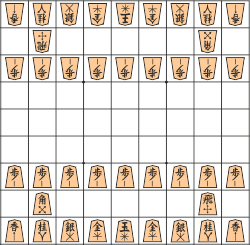 Checkmate (in Japanese, one says “Tsumi”): If a player cannot avert a danger and will be taken anyway on the next turn, this is checkmate and that player loses the game. In professional and serious amateur games, a player who makes an illegal move immediately loses the game. Repetition: the game ends if the same game position occurs four times consecutively – the game is considered a draw. However, if an eternal check originated from this situation, the player giving check and causing such a situation loses the game. all promoted pieces are canceled and points for individual pieces (including those captured) are summed up. Each rook and bishop scores 5 points and all other pieces except kings score 1 point each. A player scoring less than 24 points loses, otherwise the game is considered a draw. Pieces can move as shown by arrows on the respective pieces. No piece other than the knight can move over one's own or enemy piece which stands in the way of its potential move. A king can move one square in any direction, orthogonal or diagonal. A gold general can move one square orthogonally, or one square diagonally forward, giving it six possible destinations. It cannot move diagonally backward. A silver general can move one square diagonally or one square directly forward, giving it five possibilities. Lose their ability to current move and gain properties of gold general. A bishop can move any number of free squares along any one of the four diagonal directions. It moves like a bishop or a king, but each turn only one of two ways. A rook can move any number of free squares along any one of the four orthogonal directions. It moves like a rook or a king, but each turn only one of two ways. A lance can move any number of free squares directly forward. It cannot move backward or to the sides. Knight moves like chess knights, in an “big L” shape, but can only move forward. A pawn can move one square directly forward. It cannot retreat. The last 3 rows on the game board are called the “promotion zone”. When a piece is moved and part of a pieces's path lies within the promotion zone (that is, if the piece moves into, out or wholly within the zone), then such piece can be promoted at the end of the turn (the piece is turned over revealing the red character). Promotion is an option. However, promotion is mandatory for pawns and lances in the last row and for knights in the last two rows. A piece is always promoted at the end of its move (it is a part of the turn). A piece loses its previous skills and moves in the next turn as indicated on it after it is turned. A promoted piece cannot be unpromoted or demoted (turned back) while still in play on the board. Pieces become demoted when they are captured. A small character in the lower right-hand corner is an aid only for the players to see what piece has been promoted. Pieces are captured as follows: the attacking piece takes the place of the captured enemy piece (capturing by placement). Captured pieces are removed from the game board. A player who captured the piece acquires the piece and places it aside to be seen, next to the game board on his side, and always shown as an unpromoted piece. Capturing pieces is optional. It is not mandatory to capture an enemy piece, it is always up to the player to decide if and when to capture an opponent's piece. On any turn, a player may either move a piece on the board or drop a captured piece onto the board. A player may drop a captured piece on any empty square on the board as his own (that's why the pieces are differentiated only by their oriented tips, not by colors). By dropping a piece, a check can be given (endangering of the king does not have to be announced), or even a checkmate can be given (except by a pawn). A piece can be dropped in the path of danger and to cancel a check. A piece is always dropped unpromoted side up, even if dropped into the promotion zone. A piece should be dropped on a field where it is still possible to move such a piece for at least one more move. Pawns and lances cannot be dropped onto the last row while knights cannot be dropped on the last two rows. A pawn cannot be dropped in a column containing another unpromoted pawn of the same player (promoted pawns do not count). A pawn cannot be dropped to give an immediate checkmate (although other pieces can); however, pawns may give checkmate on any subsequent move after the pawn was dropped. Líbí se mi neomezené možnosti, taktika, strategie, nevypočítatelnost a možnost téměř kdykoliv obrátit hru. Rozhodně zábavnější než klasické šachy. Author of the original simplified version of Shogi and founder of the Czech Asociation of Shogi. Graduated of Cognitive informatics at University of Economics in Prague, graphic designer and visionary. Filip's support in Shogi and in personal life. In practice she makes online marketing and is also a graduate of the Cognitive Informatics at University of Economics in Prague.